The Powerscourt Centre is a speciality shopping centre just off Grafton Street housing expensive, luxurious brands such as All Saints and stores like Bow and The Loft. 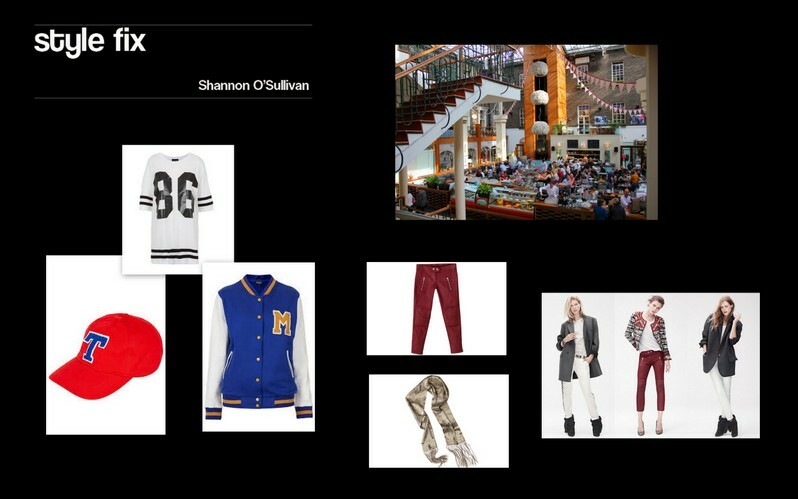 All Saints holds its own in the retail industry with celebrities like Laura Whitmore donning their chic outfits. Although these brands are pricey, the quality and longevity of their range can’t be beaten plus the clothing is comfortable stylish and edgy. Impeccable tailoring and casual options in denim and jersey (a student’s best material friend) will keep you wardrobe enviable and looking expensive yourself. Who wouldn’t want that? The smell of leather in the shop alone makes it worth a visit. So go take a whiff and spend your part-time job’s wages on a pair of boots or a winter jacket that will last forever. Bow is an independent store located on the ground floor of the Powerscourt Centre founded by three Irish female designers. They stock this homely, quirky shop with their own labels along with many others. Creativity is abundant in this store with the designers’ own workshops being a part of the retail space. MoMuse and Wendy’s Wardrobe are two of the founding designers’ labels which are sold in Bow. MoMuse’s dainty costume jewellery and bright clear cut satchels from Wendy’s Wardrobe earn this store a spot in this exclusive shopping experience. Make your way to the top floor of Powerscourt centre and The Loft is the place to browse. For an exciting and inspiring display of independent creative designs, don’t look anywhere else. The new budding talent of the Irish fashion industry swarm here to create a new kind of retail therapy. Designers such as Jocelyn Murray Boyne, Karolina Schlagner and Sookyoung Song fill The Loft with their very different lines and outlooks on style. Sookyoung adds feminine clean-cut sillhouettes to the mix in this store while Jocelyn goes for oversized, rigid pastel pieces. Karolina, however, ditches the girly, pretty approach designing jersey dresses with a grungy edge. If like mine, your wages don’t stretch as far as a €150 blouse from All Saints then do some window shopping in this sophisticated Georgian townhouse conversion and pretend like me that you’re rich for a few hours and you just didn’t see anything you liked. Better yet, save and invest in quality items that will like I said before, last forever. This highly anticipated collaboration has every Marant lover devising a clever plan of how to get to the front of that queue on November 14th. The collection hits the shops on this date and shoppers will already know what they’re looking for since the look book was leaked by a so-called ‘fashion mole’. Sneak peaks from the designer/highstreet collaboration are online now and have not disappointed Marant’s international fan base. A woman who dresses for her own comfort and laid back style, Isabel Marant is French and fancy-free. She is the perfect designer to join forces with such a popular high street chain as her designer collections attract similar age groups, although of a different financial background. Her view on style is also similar to that of the high street, combining season essentials with statement pieces to liven it all up. Her designs relate to students and young adults like ourselves who often look for comfortable yet stylish clothing with a bit of an edge. The designer does her native Paris justice by giving her collection a chic and cool Parisian feel. Cropped, skinny colourful jeans join the ranks with oversized cosy blazers and classy embellished cardigans. Flirty dresses and skirts give the collection a feminine touch while metallic accessories such as scarves and dangly earrings add a decorative element. Returning to her own personal style, the designer thankfully includes some great loosely cut jersey tops that will go with everything. If you are planning on being one of those enthusiastic people who stand in a line outside H&M for the night then make sure to do your research beforehand and know what you want. It will save you time and tears. Don’t forget some tea and a hot water bottle as the weather has gotten quite nippy and you will need to prepare yourself for the madness ahead. Oh, the thoughts of it. America, campus, football, basketball, hockey and a bit of ‘swag’ all combined to create the ever-growing trend that is Varsity. Whether it’s a daring snapback or a varsity jacket you’re wearing this season, you will be one of many sporting the trend that depicts student life itself. Cool, casual and aesthetic is a good description of the jersey themed tops which Topshop and Penneys have in stock this autumn/winter. A trip to Urban Outfitters last week made my day when I came across not jersey inspired tops but actual jerseys in dark purple and yellow trimmings. On sale for just €12 these were like something you would see in The Mighty Ducks. Remember that? Classic. Trust Urban Outfitters to get some memorabilia in. Varsity lets people who don’t like exercise, are not talented at sports or are simply a bit lazy to feel a part of a ‘team’. A non-existent one, but still.